If you plug in an audio device (such as a headset, headphones or microphone) and it cannot be identified, you will now be asked what kind of device it is. This addresses an issue that prevented headsets and microphones being used on many Dell computers. This selection dialogue is one you will get on some laptops and desktop machines when the hardware is not able to detect whether the plugged in device is headphones, a microphone, or a combination of both, probably because it doesn't have an impedance detection circuit to figure that out. This functionality was integrated into Unity's gnome-settings-daemon version a couple of years ago, written by David Henningsson. The code that existed for this functionality was completely independent, not using any of the facilities available in the media-keys plugin to volume keys, and it could probably have been split as an external binary with very little effort. 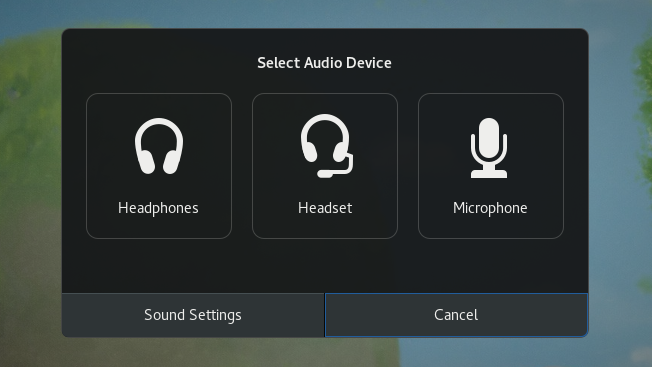 After a bit of to and fro, most of the sound backend functionality was merged into libgnome-volume-control, leaving just 2 entry points, one to signal that something was plugged into the jack, and another to select which type of device was plugged in, in response to the user selection. This means that the functionality should be easily implementable in other desktop environments that use libgnome-volume-control to interact with PulseAudio.